How do I change the name of the tennis courts? The Tennis Director has control from the Board Members Only page. 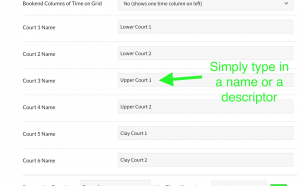 Click on Court Reservation Settings in order to name the tennis courts. 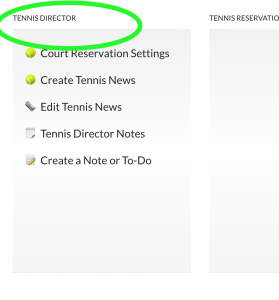 That takes you to your Tennis Director Dashboard, where you can do lots of things, including renaming your tennis courts. How do I change the amount of time members can reserve a court for? 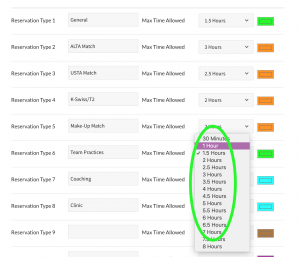 The Tennis Director Dashboard is the place for the Tennis Director to set time limits on reservations. Maybe you only want to let people reserve a court for a maximum of 2 hours. Or maybe you want to allow league matches to go for 3 hours but team practices can only reserve for 1 hour. No problem! 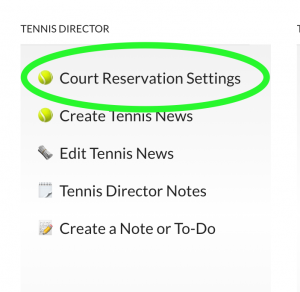 As Tennis Director, you can set a time limit for all reservation types. 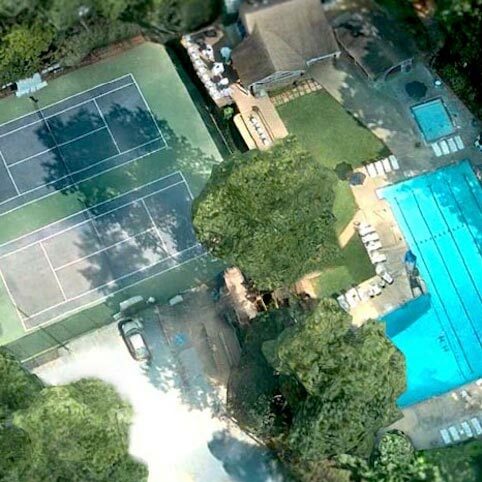 This is also where your Tennis Director can set different types of reservations. In this example, ALTA matches are different than USTA matches, which are different than K-Swiss matches. 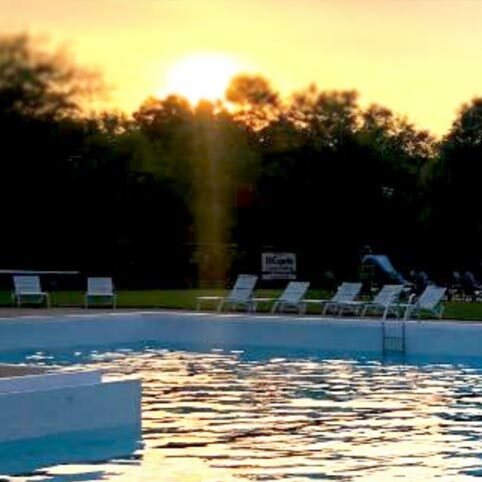 You can set practice reservations, team clinic reservations, kids lessons reservations, or any type of tennis reservation you can think of! How can I keep members updated on tennis news? Easy! 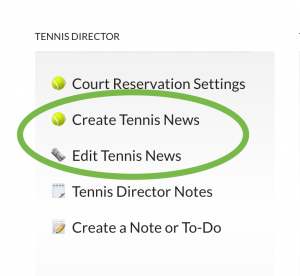 Your Tennis Director Board Member dashboard has 2 easy links for tennis news – one to create news and one to edit news. 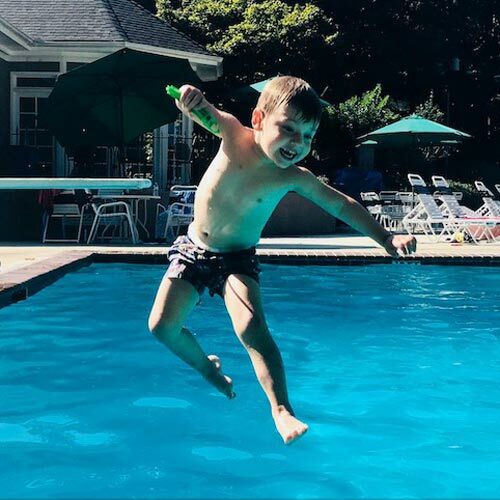 Pool Dues’ template makes it super easy! We tell you exactly what stuff to put in each field to make a great website. 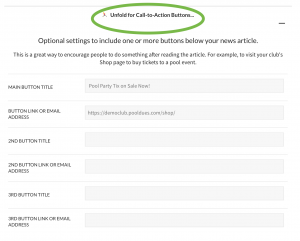 Call-to-action buttons are a great tool to encourage people to do something after reading a news article. Let’s say you post a news article about the upcoming round robin tournament. 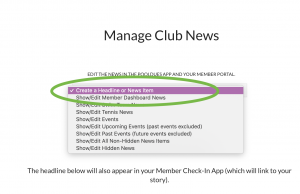 Instead of assuming people will take the time to go to the tennis shop to sign up, why not include a button with the article that takes them directly to the sign-up page? Or maybe your next Family Dinner Night is being sponsored by a local vendor. Why not add a button with the news article pointing people directly to the sponsor’s website? 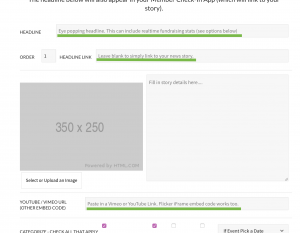 You can find the call-to-action buttons at the bottom of the Add a News Story or Event page. How can I leave notes for my successor? I did so many great things as Tennis Director that I want to pass on to the next person! Let’s face it, your Board Members serve for a limited amount of time. There should be a way for Board Members to leave notes, policies, directives, best practices, and other documentation for their successors. 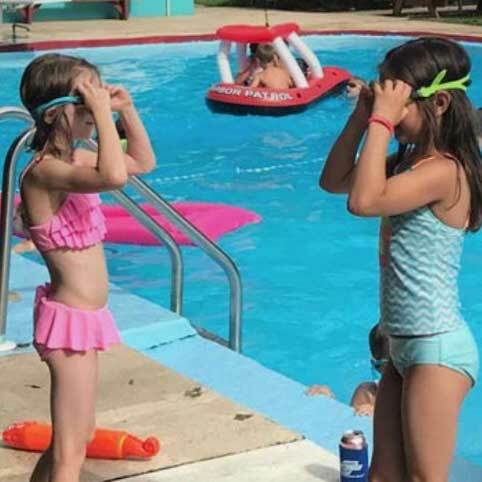 Pool Dues has the solution! 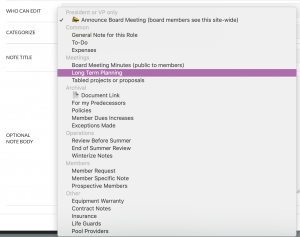 On your Board Member Dashboard are links to Create a Note or To-Do. 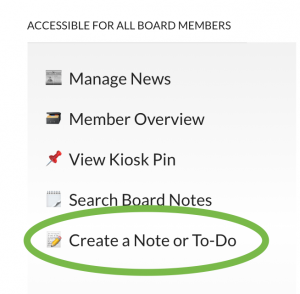 This function is so important that we’ve included it multiple times on the Board Member Dashboard – under Accessible to All Board Members links, Membership links, Treasurer links, Web Design links, Tennis Director links, and Clubhouse Manager links. When you click on the link, you have tons of options. Document policies. Make note of price changes. Store equipment documentation and warranties. Store contract documents. Notify Board Members about things that need to be done before winter and freezing temperatures. And more. Simply use this function to store all of your documentation online. No more wading through a wet and mushy box of papers (that has been sitting in the damp pool office) looking for the heater warranty. No more scrambling to find the old Treasurer’s phone number to see if they have a copy of the contract with the groundskeepers. 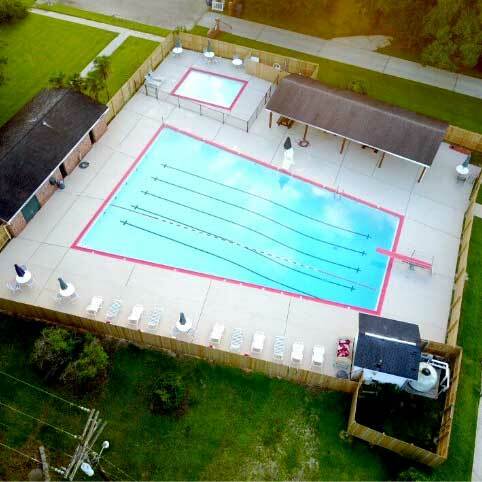 It’s all online with your Pool Dues site! Board meeting notes? Sooooo boring. But also very necessary in the efficient running of your club. 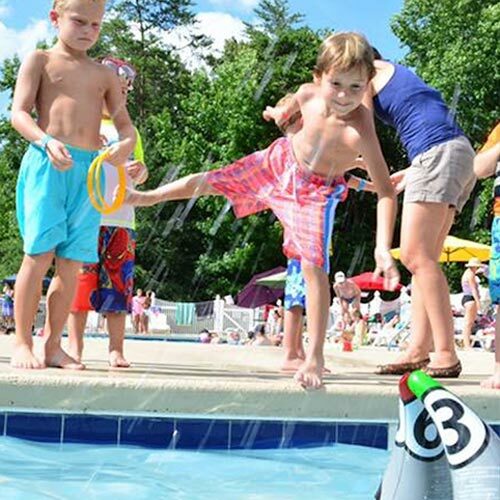 Keep those saved on your Pool Dues site too. Of course, some things are not meant to be shared with all members. Think insurance documentation. Then again, some things are meant to be shared with everyone. Think Board Meeting minutes. 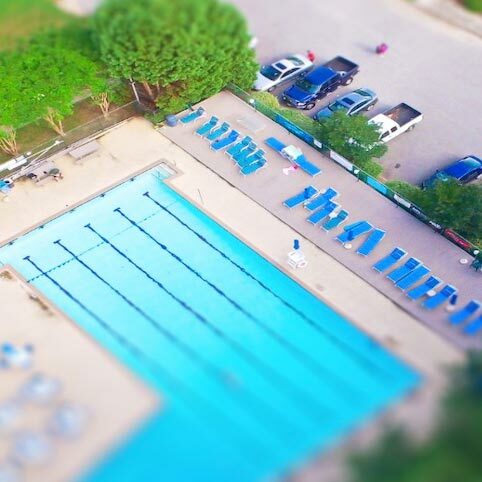 Pool Dues allows you to choose who will see your note/to-do item. You can choose who has the right to view your notes or documents. 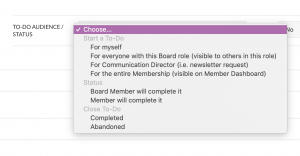 There’s also handy status options – choose who will complete the task (if applicable) and mark the task as either completed or abandoned (again, if applicable).